Stamping with Crafty Scentiments: Join My Stamping Team!!! If you have an interest in paper crafting, scrapbooking / card making and even making 3-D projects then you're who I'm looking for. I'd love to have you join me in some stamping, inky fun. Now is the perfect time to join and be a part of my team of "Crafty One's". 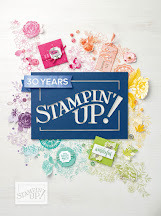 During the month of July, Stampin' Up! has an amazing offer going on. In addition to choosing $125 worth of merchandise for $99, you will receive 10 free ink pads. Contact me with any questions. I'm here for you!